Better late than never, I suppose. I took this trip on May 28th and today is June 10th. Ouray (Colorado) County Road 7 is open all the way to the Blue Lakes Trailhead, though do watch for ruts. The Blue Lakes Trail is a favorite. It leads from the end of Ouray, Colorado, County Road 7 up to the Blue Lakes at the very foot of Mt. Sneffels. County Road 7 is reached by traveling west from Ridgway, Colorado, on Colorado Highway 62. County Road 7 takes off to the south right where the highway crosses Dallas Creek—near a rather famous old red barn. Follow Ouray County Road 7 south from Colorado Highway 62. 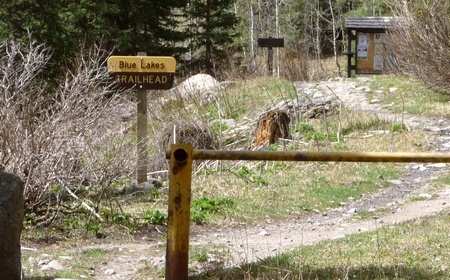 The Blue Lakes Trailhead is at the very south end. The GPS track, in blue on the map on the left, winds south. At first it travels through ranch land, including several miles through private property (stay on the road!). There’s a fork—the left hand fork is County Road 7A—stay to the right to continue on County Road 7. Note several sharp switchbacks. The road is fairly well traveled, but I did find a few ruts—just keep an eye open for them. The road winds up and up and up, with the views becoming better with every mile. You’re heading almost directly at Mt. Sneffels. After several miles you will pass the National Forest boundary (seen on the map as the thick, bluish, transparent line just below Willow Swamp). The road quality degrades here and if wet can become difficult. Fortunately, I was there on a delightfully dry and sunny Friday, May 28, 2010. The track was collected with my DeLorme PN-40 GPS and the little map snippet comes via DeLorme Topo USA 8. It took an excellent track. All the wiggling at the bottom is from traveling through numerous camping spots, plus a bit of a side road to the northwest that leads to a different trailhead. I’ll make a parenthetical mention of the fork to the east, County Road 7A. This travels entirely through ranch land and has some good views of its own. It ends at a locked gate where the blue track stops. The south end of County Road 7 offers ample primitive camp sites and it’s clear the area is designed with both people and horses in mind. On the day I arrived I met only one camper, but that was the Friday morning before Memorial Day. I would imagine it’s a popular hangout now that we’re officially into the tourist season. This shot of Mt. Sneffels and the pond is taken about halfway down Ouray County Road 7. Note that the pond is on private property—this shot is taken from the road. The views along the road are none too shabby either, as the photo above indicates. See a bit of video I took at this location on May 8th here. On May 8th the road wasn’t open all the way to the end. This is the actual trailhead. The sign doesn't actually say no motorcycles, but I'll betcha ya oughta go on foot! It should be noted there’s more than one trailhead around. The Blue Lakes trailhead is at the very south on the map. You see the GPS track jog to the west—it ends at another trailhead. I believe there are others around. I’ve always got my eye open for wildflowers, now breaking out in profusion everywhere! 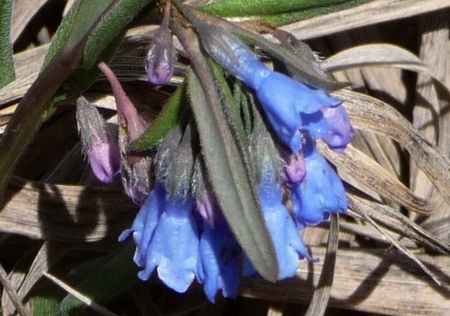 Here’s a little blue jobbie that looks a lot like a blue bell. Tiny blue wildflowers, perhaps 20mm long. Now that a rather wet spring seems behind us, I expect more wildflowers everywhere. I’m told the roads to the high country are opening, so that’s where I’ll head next. This entry was posted in Motorcycling, Ouray County, Wildflowers. Bookmark the permalink. Tom, for fall color be sure to check out Last Dollar Road, which has some of the most spectacular fall color in the area. Conway, AR. Seniors. We have always toured Colorado in mid summer, like the high country. Mary, I’m not up on hiking in the area, preferring something with an engine. 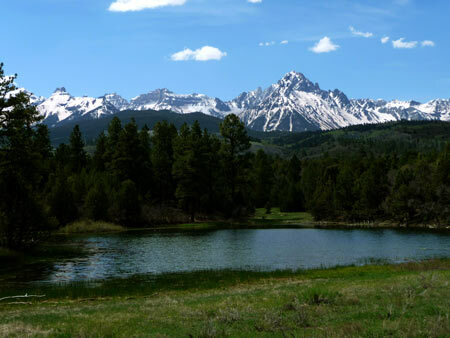 But if you’ll go to the Ouray Chamber Resort Organization, you’ll find a page on hiking. That page has a pdf you can print with more information. One very popular trail is Weehawken, which starts not far out of Ouray, a short distance along Camp Bird road. We have a very heavy snow load right now, much more than normal. Thanks for the info. If we aren’t able to do the Blue Lakes trail, do you know of any other good day hikes in the Ouray area that are more accessible? Mary, the road is okay until you get to the Forest Service boundary. At that point it can be really iffy. Ruts can be quite deep. If you’re very, very careful, you might be able to make it. It just all depends on how long since the last rainfall. I haven’t been up there yet this season because the high country has seen so much snow that not much is open. Next time I go up I’ll try to look at it from the point of view of a 2WD car. Hello! My friend and I may try to hike Blue Lakes this July. Can you get to the trailhead in a 2WD passenger car? How are the switchbacks on the way? Are they very steep? Thanks!